I popped in H&M a couple of days ago to check out some of their new arrivals for Spring. Coral, orange and peach are definitely the top colors for Spring 2011. I ended up didn’t get anything but here are a few items that I brought with me to the fitting room if you’re interested. Some of you might have heard that H&M has decided to have online shopping in the US at the turn of the year 2011/2012. That is great news! Although, there are 2 H&Ms near by, I still love the idea of online shopping. Hubby is buried in work so he is going to spend all day today at work :( Before he left, he told me to go shopping and have some fun. LOL. I am probably going to hit the outlet today with my family. Have a great weekend, everyone! Happy shopping, Sydney! Your hubby is truly a sweetheart. I think the skirt looks lovely on you. It's quite a unique pattern and design. Love it. Have a great weekend, Sydney! Have a great time Sydney - I'm so jealous! Didn't know that about the H&M stores, but I'm so glad to hear it!! I was there yesterday, but did not see that skirt! Did you get? That coat is great!! And no sleeve rollin'! Perfect! I really love that skirt on you! I think the birds are so cute! What I would be nervous about is maintenance since you said it is stiff, and there are pleats in it. That jacket is pretty cute! I was in H&M today and yesterday, and they have some really nice things for Spring. It's great that they're introducing online shopping for the US too. Their UK online store opened a few months ago, but for some reason they don't carry nearly as many items online as they do instore... I hope that changes. Everything is really cute - I really love the navy coat and the print skirt! I'm a big fan of ruffles, but I agree - the ruffles on that particular top are a bit overwhelming, especially on a petite frame like yours. Great reviews! The skirt is my favorite. The print is so cute, very a la Miu Miu. I also adore that shade of blue, but the ruffles do seem like a bit much. Have a fun day shopping, Sydney! I hope I will be able to do the same one day and teach my future children! I almost feel like they would have to live with Grandma or Grandpa (on either side) to learn! Love the first coat!!! The blue ruffle top is great!!! I got that jacket in black. The shoulders part look too puffy when I wear it but on u, it looks perfect. 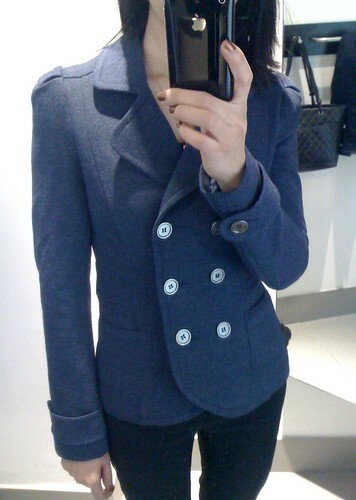 Oooh my favorite is the navy blue jacket! Is it more of an outerwear type of jacket or a blazer type? I actually think the tulip skirt looks gorgeous on you (I especially love the print - the birds give it such a fun whimsical feel). I was at H&M yesterday lol! I got a blazer and striped sweater. Both of them fit really tiny. 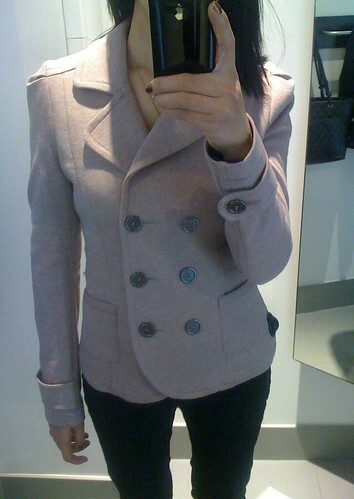 So excited for online shoppng:) I love the coats! They fit great and look way more expensive than they are! 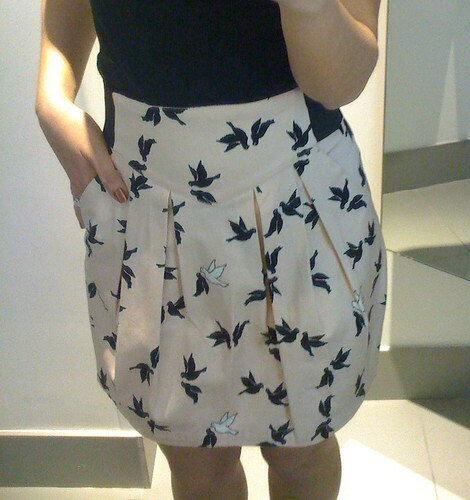 The skirt is really cute too. I agree with you on the tops though, a bit too ruffly for me. Jean-if you're reading this: just curious-how do you keep this sweatshirt material from fading when washing it, like how sweats normally fade?? @I am Khatu No, I didn't get it. I don't think it is flattering on me. @SewPetiteGal The one I tried on was more of an outerwear type of jacket. They do have the blazer version made from the same type of material. @AubreyOhDang! Good question, Aubrey :) I am not sure how to keep the sweatshirt material from fading. This jacket has lining so obviously, I can't throw it in the washer/dryer. Hmm... so anything with lining can't be thrown in the washer/dryer? That's news to me! I throw everything in lol. 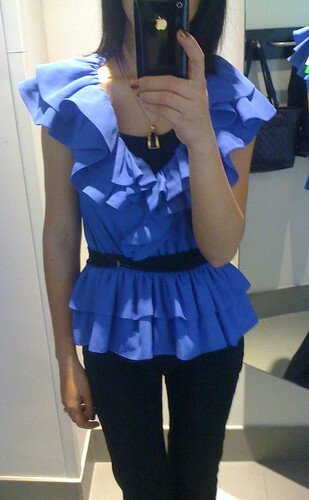 I tried that ruffle top on too btw... waaaay too much going on and I felt like it was eating me alive! I actually don't think the tulip skirt is unflattering on you, but I'd have a hard time styling it too. ^^^^yeah, I didn't know that if it has a lining, you shouldn't wash/dry it. Also news to me! Very cute coat, great colour!